Lemon Poppy Seed Vinaigrette is by far my favorite salad dressing of the summer. It goes well with just about any salad combination; I recommend tossing the salad with mixed greens, strawberries, pecans, shaved shallots, goat cheese, and a little grilled chicken — yum! It makes 1 1/2 cups. Summer salads have everything going for them. They are fresh, packed with extra virgin olive oil flavor and have contrasting textures. Bursting with colors, they are quick to toss together, easily portable and a great team player at any summer cookout, party or reunion. So savor summer with salads made with vegetables, greens, pasta, grains fruits and extra virgin olive oil. Roasted Beet Salad with Goat Cheese and Pistachios: In large bowl, whisk together 2 tablespoons extra-virgin olive oil, 4 teaspoons sherry vinegar, 1/2 teaspoon salt and 1/2 teaspoon pepper. Add 2 pounds skinned, roasted beets sliced into wedges. Toss to coat. Add 2 cups baby arugula. Gently toss to coat. Season with salt and pepper. Transfer to platter. Sprinkle with 1/2 cup crumbed goat cheese and 2 tablespoons toasted, chopped pistachios. Chopped Greek Salad: In medium bowl, whisk together 1 tablespoon red-wine vinegar, 1 teaspoon dried oregano and 1 clove crushed garlic. Gradually whisk in 1/4 cup extra-virgin olive oil. Add 1 diced green pepper, 2 seeded and diced Kirby cucumbers, 2 diced tomatoes, 2 chopped scallions, 1 1/4 cup crumbled feta and 1/3 cup chopped pitted kalamata olives. Season to taste with salt and pepper. Warm Potato Salad with Lemon and Mint: In salted boiling water, cook 3 pounds peeled and diced russet potatoes until al dente. Drain. Transfer to serving bowl. Season with 1 teaspoon salt, juice of 3 lemons and 1/4 cup extra-virgin olive oil. Stir gently. Add salt and pepper to taste. Set aside to cool. Add 1 bunch finely sliced scallions and 10 fresh mint leaves cut in chiffonade. Stir gently. Kale Salad with Parmesan and Pine Nuts: In large bowl, whisk together 2 tablespoons lemon juice and 1 tablespoon champagne vinegar. Season with salt and pepper. Drizzle in 1/3 cup olive oil until emulsified. Add 2 bunches Tuscan kale (about 1 pound, center ribs and stems removed, leaves thinly sliced crosswise) and 2/3 cup toasted pine nuts. Using hands, toss. Set aside to marinate for 10 minutes. Just before serving, add 1 cup shaved parmesan. Toss to combine. Club Sandwich Salad: In small bowl, combine 2 tablespoons Dijon mustard, 1/2 cup tahini, 1/4 cup apple-cider vinegar, 1 tablespoon honey, 1 teaspoon soy sauce, 2 tablespoons chopped fresh parsley, 1 clove garlic, 1/4 teaspoon crushed black peppercorns and 1/2 teaspoon dried thyme. Set aside. In large bowl, toss 1 head romaine lettuce (chopped), 6 halved cherry tomatoes, 1 large shredded carrot. Add 1/2 pound sliced, cooked turkey cut into bite-size pieces. Top with 2 tablespoons bacon bits and 1/2 cup croutons. Drizzle with dressing. Toss and serve. Caesar Salad With Lemon Pepper Shrimp: Marinate 1 pound shrimp in 2 teaspoons extra virgin olive oil, 1/2 teaspoon pepper and 1/2 teaspoon lemon zest. Grill shrimp, Toss with 3 tablespoons lemon juice. Set aside. In large bowl, whisk together 2 egg yolks (or 1/4 cup pasteurized egg substitute), 1 clove garlic (minced), 1 teaspoon anchovy paste, 1/2 teaspoon Dijon mustard, 1/4 teaspoon Worcestershire sauce and 2 tablespoons lemon juice. Slowly whisk in 2 tablespoons olive oil. Stir in 1/4 cup grated parmesan. Add 8 cups coarsely torn romaine lettuce. Toss to coat. Season with salt and pepper. Top with grilled shrimp. Chicken Satay Salad: Coat 2 skinless, boneless chicken breasts with 2 tablespoons peanut sauce, 1 tablespoon vegetable oil, 1/2 teaspoon chile powder and 1/2 teaspoon salt. Grill for 3 minutes per side. Set aside. In small bowl, whisk 5 tablespoons peanut sauce, 3 tablespoons extra virgin olive oil, 2 tablespoons lemon juice, 2 tablespoons water and salt and pepper to taste. Set aside. In large bowl, combine 1 chopped leaf lettuce (torn coarsely), 1/2 head romaine (torn coarsely), 1/2 cucumber (cut into matchsticks), 1 medium carrot (cut into matchsticks), 1 red pepper (thinly sliced) and -3/4 cup cilantro (chopped). Top salad with chicken and 3 tablespoons peanuts. Drizzle with dressing. Spanish Chopped Salad: Blend 1 clove garlic, 1 tablespoon red-wine vinegar, 3 tablespoons walnut pieces, 1/2 teaspoon smoked paprika, 2 teaspoons honey, 2 tablespoons parsley, 1/3 cup extra virgin olive oil and 1/2 teaspoon salt. Blend until smooth. Set aside. In large bowl, combine 1 chopped head romaine, 2 cups baby spinach, 1/4 red onion (sliced), 1/3 cup walnut pieces, 1 cup halved cherry tomatoes, 1 small finely diced apple and 1 cup finely diced cucumber. Toss to combine. Add dressing. Top with 1 cup shaved Manchego cheese. Mexican Tortellini Salad: In small bowl, blend 1 teaspoon shallot (minced), 1 clove garlic (minced), 1 cup fresh cilantro and juice of 1 large lime. Add in 1/3 cup extra virgin olive oil. Season with salt and pepper. Set aside. Place 2 cups of cooked cheese tortellini in large bowl. Add half of vinaigrette. Add 1/2 cup cooked corn, 15-ounce can black beans (rinsed), 1 1/2 cups halved grape tomatoes and 2 chopped avocados. Toss to combine. Add 1/2 cup cojita cheese. Season to taste with salt and pepper. Orzo Salad with Chickpeas, Lemon and Dill: Place 1 cup cooked orzo in large bowl. Add 1/2 cup green onions (thinly sliced), 1/2 cup crumbled feta cheese, 1/4 cup chopped dill and 19-ounce can chickpeas (drained). Toss gently to combine. Set aside. In small bowl, whisk together 3 tablespoons lemon juice, 1 1/2 tablespoons extra-virgin olive oil, 1 tablespoon cold water, 1/2 teaspoon salt and 1/2 teaspoon bottled minced garlic. Drizzle over pasta mixture. Toss to coat. Deconstructed Pesto Salad: In skillet, heat 6 tablespoons extra-virgin olive oil. Add 8 thinly sliced cloves of garlic. Cook for 4 to 8 minutes or until golden brown. Remove from heat. Stir in -3/4 teaspoon salt and 1/4 teaspoon pepper. In large bowl, combine 1 pound cooked fusilli and 1/2 cup reserved cooking water. Add olive oil mixture. Toss well. Add 1/2 cup toasted pine nuts and 4 ounces coarsely grated or shaved Pecorino Romano cheese. Toss. Just before serving, add 2 cups sweet basil leaves cut into 1/2-inch-wide chiffonade. Toss. Roasted Tomato Pasta Salad: Chop 1 large clove garlic. Add 1 1/2 tablespoons dried oregano, 1 1/4 teaspoons salt and a few grinds of black pepper. Using knife, mince mixture until grainy paste forms. Transfer to small bowl. Add 3 tablespoons lemon juice and 3 tablespoons wine vinegar. Whisk in 1/3 cup extra virgin olive oil. Set aside. In large bowl, combine 1 pound cooked pasta, 4 cups roasted grape tomatoes, 6 ounces ricotta salata, 1/2 cup toasted pine nuts and 1/2 cup olives (pitted and chopped). Add dressing to taste. Season with salt and pepper. Top with 1 handful of chopped basil leaves. Minted Summer Couscous with Strawberry and Feta: In small screw-top jar, combine 2 teaspoons lime zest, 3 tablespoons lime juice (from 3 limes), 2 tablespoons extra virgin olive oil, 2 teaspoons honey, 1/4 teaspoon salt and 1/4 teaspoon pepper. Shake vigorously until dressing is amalgamated. In large serving bowl, combine 2 1/2 cups cooked couscous (1 cup dry), 1 1/2 cups sliced strawberries, 1/2 cup celery and 1/2 cup loosely packed torn fresh mint leaves. Drizzle with dressing. Toss to combine. Season with salt and pepper. Top with 1/2 cup crumbled feta. Garden Tabbouleh Salad: In small bowl, combine 1/2 cup extra virgin olive oil, 2 teaspoons salt, 1/4 chile powder and 1/4 cup lemon juice. Whisk until creamy. Set aside. Pour 1 cup hot water over -3/4 cup bulgur. Let site for 30 minutes or until water is absorbed. In large bowl, combine 2 cups parsley (cut chiffonade), 1 cup diced tomato, 1/2 cup cucumber, 4 finely diced green onions and 1 tablespoon chopped mint. Add bulgur and mix. Drizzle with dressing. Toss to coat. Dried Cherry and Brown Rice Salad: In large bowl, mix 1 cup cooked brown rice, 2 cups canned lentils (rinsed and drained), 2 cloves garlic (minced), 1/2 red onion (diced), 1/4 cup chopped fresh parsley, 2 tablespoons chopped mint leaves, 1/2 cup roughly chopped walnuts, 2 tablespoons soy sauce and 1/2 cup dried cherries (softened in hot water). Refrigerate for 20 minutes before serving. Quinoa Salad with Oranges and Dates: Place 6 cups cooked quinoa (2 cups dry) in large serving bowl. Add 2 cups chopped orange segments and 1/2 cup chopped pitted dates. Stir to separate any chunks. Set aside. In another bowl, whisk together 1/4 cup plus 2 tablespoons orange juice, 1 tablespoon orange zest, 1 tablespoon sherry vinegar, -3/4 teaspoon salt and 1/4 teaspoon pepper. Gradually beat in 1/4 cup extra virgin olive oil. Stir in 1/4 cup chopped parsley. Pour dressing over salad. Toss to combine. Top with 1/4 cup toasted pistachios. Corn Bulgur Salad: In skillet, heat 1 tablespoon extra virgin olive oil. Add 3 cups corn kernels and 1/4 teaspoon salt. Saute for 5 minutes. Add 1/4 medium-size red onion (diced). Saute for 3 minutes until corn is tender. Set aside to cool. In large bowl, toss corn with 1/2 cup cooked bulgur, 1 jalapeno (thinly sliced), 2 tablespoons of lemon juice, few pinches of cayenne pepper and salt to taste. Add 1 tablespoon of chopped cilantro before serving. Watermelon, Feta and Blueberry Salad: In large bowl, mix 2 1/2 cups watermelon (cubed) and 1 cup blueberries. Set aside. In small cup, mix 2 tablespoons lemon juice and 2 tablespoons honey. Pour over fruits. Add 1/4 cup finely chopped mint leaves. Top with 1/4 cup crumbled feta cheese. Mix gently. Chill before serving. Tropical Fruit Salad: In large bowl, mix 1/2 cored and cubed fresh pineapple, 1 peeled and cubed mango, 1 peeled and cubed papaya and 2 peeled and sliced kiwis. Drizzle with juice of 1/2 lime. Divide fruit among 4 plates. Pound 1 small bunch fresh mint with 2 tablespoons castor (superfine) sugar. Top each plate with 1 dollop yogurt. Sprinkle each plate with mint sugar. Garnish with additional fresh mint leaves. Strawberry Salad: In small bowl, combine 3 tablespoons honey, 3 tablespoons Dijon mustard and 3 tablespoons orange juice with pulp. Chill for 20 minutes. In large bowl, toss together 1 1/2 cups hulled and halved strawberries, -3/4 cup halved seedless grapes, 1/4 cup torn mint leaves and 4 to 6 cups baby spinach. Drizzle with dressing before serving. Fennel, Citrus and Avocado Salad: In small bowl, whisk together 2 tablespoons white-wine vinegar, 2 tablespoons orange juice and 2 tablespoons extra virgin olive oil. In large bowl, toss 4 handfuls mache with dressing. Place on serving plate or bowl. Peel and segment 3 oranges. Season with salt and pepper. Arrange orange segments on top of mache. Top salad with 2 fennel bulbs (sliced wafer thin) and 2 sliced avocados. Coconut-Watermelon Salad: In 400-degree oven, toast 1/3 cup sweetened coconut flakes until golden brown. Set aside to cool. In small bowl, combine 3 tablespoons condensed milk, 2 tablespoons heavy cream, juice of 1 lime and 1/4 teaspoon salt. Drizzle mixture over 5 cups of cubed watermelon. Top with coconut flakes before serving & drizzle with extra virgin olive oil. Sources: “The Complete Vegetarian Cookbook” by America’s Test Kitchen; “Mastering the Art of Vegan Cooking” by Annie and Dan Shannon; “Simply Ancient Grains” by Maria Speck; “Rosewater & Orange Blossoms” by Maureen Abood; “The Big Book of Sides” by Rick Rodgers; “Seven Spoons” by Tara O’Brady; “Southern Living Ultimate Book of Barbecue”; Food Network Magazine; smittenkitchen.com; cookinglight.com; and twopeasandtheirpod.com. You need a big bowl to toss a salad; don’t pack all the ingredients in a small one as the salad would end up looking disheveled. — Use only fresh lettuce. — Wash greens well to keep food-borne illnesses at bay. Also, dry greens well as the dressing will cling to them better and the flavor won’t be diluted. — Don’t add greens that are too cold or too warm. — Use lots of colors for maximum nutrition. Add herbs and vegetables such as peppers, carrots, tomatoes and radishes. — Before you add any dressing, season the salad with salt and pepper. — The best tools to toss a salad are your hands. Run your fingers down the sides of the bowl bringing the greens and vegetables at the bottom to the top. This way you won’t crush them. — Toss well with dressing. This uses less dressing and cuts the calories. — Add ingredients that you can chew on such as canned beans, grilled chicken or tuna and robust vegetables such as beets. — Make sure the salad has texture and is crunchy by adding roasted seeds, fennel, peppers, onion, nuts and cucumbers besides standbys such as celery and croutons. Spanish Chopped Salad: Blend 1 clove garlic, 1 tablespoon red-wine vinegar, 3 tablespoons walnut pieces, 1/2 teaspoon smoked paprika, 2 teaspoons honey, 2 tablespoons parsley, 1/3 cup olive oil and 1/2 teaspoon salt. Blend until smooth. Set aside. In large bowl, combine 1 chopped head romaine, 2 cups baby spinach, 1/4 red onion (sliced), 1/3 cup walnut pieces, 1 cup halved cherry tomatoes, 1 small finely diced apple and 1 cup finely diced cucumber. Toss to combine. Add dressing. Top with 1 cup shaved Manchego cheese. Mexican Tortellini Salad: In small bowl, blend 1 teaspoon shallot (minced), 1 clove garlic (minced), 1 cup fresh cilantro and juice of 1 large lime. Add in 1/3 cup olive oil. Season with salt and pepper. Set aside. Place 2 cups of cooked cheese tortellini in large bowl. Add half of vinaigrette. Add 1/2 cup cooked corn, 15-ounce can black beans (rinsed), 1 1/2 cups halved grape tomatoes and 2 chopped avocados. Toss to combine. Add 1/2 cup cojita cheese. Season to taste with salt and pepper. Roasted Tomato Pasta Salad: Chop 1 large clove garlic. Add 1 1/2 tablespoons dried oregano, 1 1/4 teaspoons salt and a few grinds of black pepper. Using knife, mince mixture until grainy paste forms. Transfer to small bowl. Add 3 tablespoons lemon juice and 3 tablespoons wine vinegar. Whisk in 1/3 cup olive oil. Set aside. In large bowl, combine 1 pound cooked pasta, 4 cups roasted grape tomatoes, 6 ounces ricotta salata, 1/2 cup toasted pine nuts and 1/2 cup olives (pitted and chopped). Add dressing to taste. Season with salt and pepper. Top with 1 handful of chopped basil leaves. Most people reach for prepared salad dressings because on busy weeknights they just can’t handle the thought of whipping up yet something else. Because after cooking a main course and some sides and tossing together a salad, who has the time and energy to make a dressing? I get it. It’s convenient. But homemade dressings are so much better, they really are worth the trouble. Homemade dressings not only are fresher and taste better, they also are better for you. The good news is that making dressing doesn’t have to be a daily chore. In just five minutes you can prep one big batch of dressing for the entire week. So let’s walk through the basics of vinaigrettes. The standard recipe for a vinegar-based dressing calls for a 3-to-1 ratio of oil to vinegar (or other acid). But really that’s just a starting point. Years ago when I was teaching a class in basic techniques, I tested the validity of that ratio by asking my students to make dressings of their own. All of them used olive oil, but each one picked a different acid. That was an eye-opener! Three tablespoons of oil swamped rice vinegar, but barely balanced the acidity of sherry vinegar. Bottom line: The acid content in vinegars can vary widely, so you’ll want to adjust for that. What about the oil? Mostly, I opt for good quality extra-virgin olive oil. You want to break out the good stuff because you’re really going to taste it in a dressing. But if you don’t like the taste of olive oil, you can use an oil with a more neutral flavor, such as grapeseed (though it’s pricey). Safflower and sunflower are less expensive and also are perfectly acceptable. Nut oils are another way to go, including walnut and hazelnut, as well as two of my favorites: pistachio and pumpkinseed. They pair up very well with fruit vinegars, such as raspberry. What are the best ways to mix a vinaigrette? The easiest include measuring and mixing it in a glass measuring cup, shaking it in a jar (an almost empty mustard jar is a good choice), or briefly whizzing it up in a blender. And I say briefly about the blender because too much whizzing may make olive oil taste bitter. Start with the acid, salt and pepper, and mix them until the salt is dissolved. 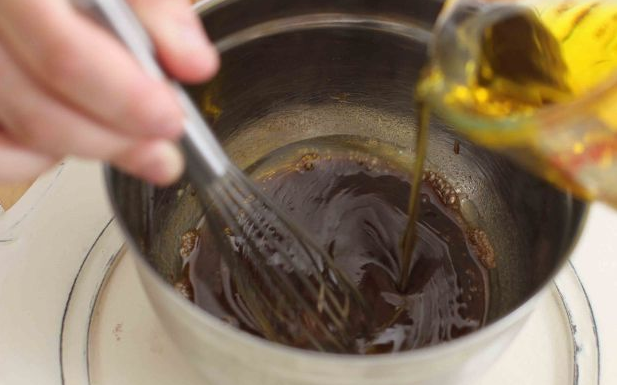 Then, if you’re using a measuring cup, add the oil slowly in a stream, whisking until it’s incorporated. If you’re mixing it in a jar, add all of the oil and shake. If you’re using a blender, add the oil and pulse until well combined. A vinaigrette is a temporary emulsion, meaning that when you whisk or shake it, the oil and vinegar will combine long enough to coat your salad. Eventually, though, these components will separate again. You can make the dressing stay together longer by adding an emulsifier, such as mustard or an egg. I prefer mustard, not only because of its power to emulsify, but because I really like its taste. Tasty add-ins? Your choice: minced shallots (which contribute a pleasantly sweet crunch), a minced clove of garlic, chopped fresh herbs, a bit of soy sauce or miso, crumbled cheese, grated fresh citrus zest or capers. Want to cut down the vinaigrette’s calorie count? Cut down the amount of oil. Depending on my mood, I’ll swap in chicken broth, pureed fresh tomato or roasted red pepper, or pureed (very ripe) pear, all of which contribute flavor and body. Sugar, too, can replace oil, which is why relatively sweet balsamic vinegar requires relatively less oil for balance in a vinaigrette. But I ‘m not a fan of sugar in dressings. We already eat way too much. By the way, there’s no reason to confine vinaigrettes to the salad bar. They can perk up grilled vegetables, chicken or steak, and they partner up beautifully with fish. In a 1-cup measuring cup or screw-top jar, combine the acid, salt, mustard and pepper. Whisk (or cover and shake if using a jar) until the salt is dissolved. Add the oil in a steam while whisking (or add the oil all at once and shake if using a jar). Store in the refrigerator. Let the vinaigrette come to room temperature before using. Nutrition information per tablespoon: 90 calories; 90 calories from fat (100 percent of total calories); 10 g fat (1.5 g saturated; 0 g trans fats); 0 mg cholesterol; 0 g carbohydrate; 0 g fiber; 0 g sugar; 0 g protein; 260 mg sodium. This recipe took even less time, because, unlike the first recipe that requires cutting and chopping, making the Olive Oil Flatbread dough is just a matter of unceremoniously dumping everything in a bowl and using a little French spatula (a flexible little plastic scraper – also called a dough scraper), rather than a wood spoon to mix everything and bring it into a nice big ball. Even better is to dump all the ingredients into the bowl of a food processor or standing mixer, in which case the whole procedure literally takes about 30 seconds. Mix all the ingredients together – either by hand or with a food processor or standing mixer – until it becomes a nice, soft ball of dough. Let rest for about 10 minutes. divide the dough into about 12 pieces (or more, if you want the flatbreads smaller). Roll the dough into flattened discs. Do not worry if they’re not perfectly round, or if they are different sizes. Brush a non-stick frying pan with olive oil, and fry the dough a few seconds on each side, turning the dough often to prevent burning. This recipe is especially good in the summer, when tomatoes are ripe. You can make it in the morning, and then cover the bowl and let it sit on the counter for a few hours as the flavors meld and the brie oozes. Provide slices of a good-quality bread for dipping and scooping, and you’ll hear the swoons from your guests as they eat this amazingly delicious but amazingly simple recipe. 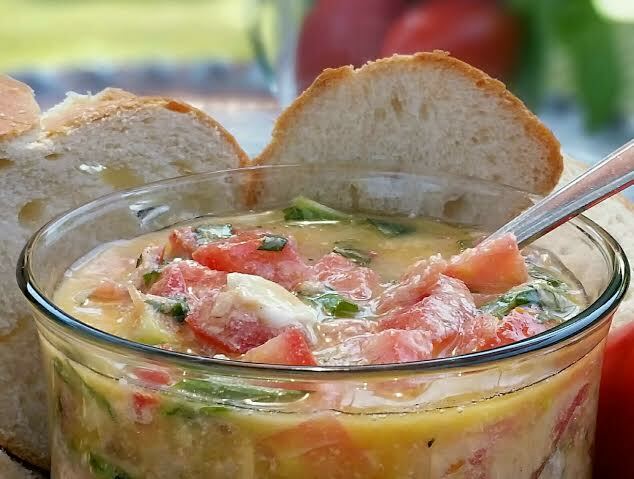 Combine the tomatoes, Brie, basil, garlic, olive oil, salt and pepper in a large serving bowl. Stir gently to combine. Let stand covered at room temperature at least two hours. Serve with bread to soak up the marinade. This is a room temperature sauce that warms when tossed with very hot pasta. It’s quick dish and perfect for a hot weather meal. Combine the tomatoes, garlic, a teaspoon or so of salt, the chile pepper, if using, 1/3 cup of the basil, and the oil in a large bowl. Cover and set aside at room temperature to marinate for several hours. If you must refrigerate the sauce at any point, be sure to give it plenty of time to come back to room temperature before serving it. When ready to serve, bring 5 to 6 quarts water to a rolling boil in a pasta pot. Add salt, and when it comes back to a boil, simply add the pasta, cook, drain, turn into a heated serving bowl, and immediately toss with the sauce. Garnish with the remaining 2 tablespoons basil and serve immediately. Makes 4 to 6 servings. Cover the fish fillets with the citrus juice in a bowl. Cover the bowl with plastic wrap and refrigerate for at least 6 hours, or overnight. Mix together the oil, cilantro, onion, tomato and chiles and spoon over the fish. Cover once more and set aside until ready to serve. Before serving, taste a small piece of fish. 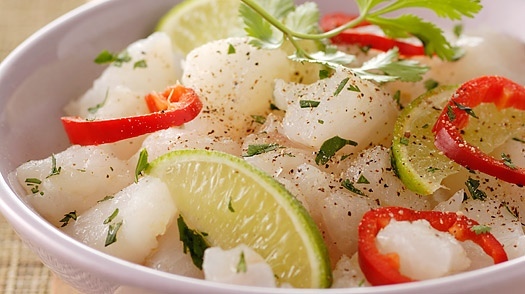 You probably will not need to add more acid since the citrus flavors will have penetrated the fish, but serve it with lemon wedges (or limes) in case someone wants to add more. Makes 8 servings as a first course. Recipes Source: “Virgin Territory: Exploring the World of Olive Oil” by Nancy Harmon Jenkins. This classic Pico de Gallo recipe will become your new go to chip dip. Try it on tacos, grilled meat or seafood, or toss it with pasta and chicken for a quick pasta salad. You can use standard extra virgin olive oil in this recipe, but a chile-infused olive oil, is also delicious. Extra Virgin Olive Oil also works nicely here! Combine all ingredients in a bowl and mix with a spoon until combined. Taste and adjust seasoning with salt and pepper. The key to making a healthy salad dressing isn’t hidden in any secret recipe. The trick is knowing what ingredients make up a healthy salad dressing and the learning to mix those ingredients in a way that treats your personal food preference. Keep in mind you’ll probably need a blender for many of these ingredients. You might not think tofu has a place when it comes to a healthy salad dressing, but tofu can be the secret ingredient if you want a healthy, creamy dressing. Tofu will give dressing substance like cheeses or mayonnaise would but won’t carry all the calories or fat. Tofu can be mixed with small amounts of low-fat cottage cheese and low-fat flavorful cheese (like blue cheese) for a creamy topping. This is a staple when it comes to homemade salad dressings, but the fun thing about vinegar is that it can be purchased in a variety of flavors. Raspberry vinegar, for example, can be used with oil (also can be flavored) or low-fat buttermilk to create the base for a light but tasty dressing. Olive Oil is one of those ingredients you have to think carefully about. Oil will add calories, but if you use healthy oil, like extra virgin olive oil, there are health benefits to be had. Healthy oils are one of the staples in the Mediterranean diet, known as the world’s healthiest eating routine. The Mayo Clinic indicates olive oil may help lower cholesterol, improve blood sugar regulation and may improve blood clotting. There are many other natural oils out there; don’t be afraid to experiment. Lime or lemon juice–depending on personal taste–can be used to thin the consistency of dressings, oil-based or creamy. These two juices also add their own acidic flavor to prevent dressing from becoming too sweet. This is where you can really individualize when it comes to your salad dressing. While there are herbs and spices that seem like staples in dressing: basil, garlic cilantro, pepper, etc., you can use whatever herbs and spices you want. Not sure whether to make your next bottle of ‘special’ olive oil Spanish, Italian or French? Well how about going a bit further afield and all the way to Crete? “oi1 PDO Viannos” landed on our doorstep and immediately started a debate with some saying that while Cretian olives were fine to nibble when on a beach they were no use at all as oil. A bit unfair the others thought and reached for some bread to dip with while someone else filled a saucer. 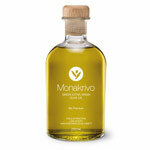 The olive oil is cold extractedfrom Koroneiki olives in the Viannos PDO region, one of the 9 PDO regions of Crete, regions that have been certified for the quality of their unique product thanks to the specific soil and climate conditions of the region. Whisk together olive oil, red wine vinegar, and hummus. Steam the vegetables for 5 minutes and rinse them under cold water; set aside. In a bowl, whisk together the vinegar with the Elladin extra-virgin olive oil. Add the vanilla seeds, mint, salt and red peppercorns. Serve on top of the warm vegetables. Boil water in a pot with the white wine vinegar and a pinch of salt. When the water is boiling, drop the eggs carefully in the water. Cook for 5 minutes. Remove from the heat and tap them with a knife, holding each in one hand. Remove the shell carefully. Serve on top of the vegetables and sprinkle with red peppercorns. Serve with crusty bread on the side. 1. Combine water and wheat berries in a medium saucepan and bring to a boil. Reduce heat, cover and simmer 55 minutes or until wheat berries are just tender. 2. Place in a fine mesh strainer and run under cold water to cool quickly, drain well. 3. Combine the wheat berries with the remaining ingredients in a medium bowl. Serve immediately or cover with plastic wrap and refrigerate up to 8 hours in advance. Want to try a raw food dish at home? Matteo Silverman shares his recipe for a kale avocado salad, which is a favorite at Juice Generation. “People who don’t even like kale — this will convert them,” says Silverman. 1. In a large bowl, mash the avocado with olive oil, lemon juice, sea salt and black pepper. 2. Place torn kale in the large bowl. Using your hands, gently massage the avocado into the kale until well-coated. 3. Combine carrots, raisins and sunflower seeds with the kale and avocado mix. Adjust seasoning if necessary.